This is the only conditioner that I trust with my curls! I use this conditioner at least 5x a week. Other conditioners break down my hair, Pantene builds it up. I even add some water to it in a spray bottle to spritz on my curls in the mornings before class for a little refresher. I love the smell that this leaves. 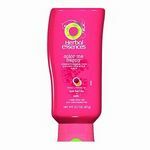 My hair is very smooth and soft when I use this conditioner. I find that my hair isn't as frizzy as it normally is when I use this! Pantene always leaves my dry, brittle hair feeling soft and looking shiny and healthy. I do recommend alternating use with a different brand regularly because over time Pantene leaves a residue on your hair. Since I was 18 haven't changed brand. Love the smell and the way it leaves my hair. Every time I can I buy it. I received a sample of this product in the mail and absolutely fell in love with it. It works perfect for me and I will not use anything else. Pantene Smooth & Sleek leaves my hair feeling soft and makes it manageable. It has a great scent that will stay with you throughout the day. I have long straight hair and have struggled with frizz due to humidity and other factors for years. This is no longer an issue since I have started using Pantene Smooth & Sleek Conditioner and Shampoo. Other brands leave my hair really frizzy and dry looking. Pantene's conditioner is the opposite. My hair gets tangled up when I work out, no need in even brushing it prior to washing it. The conditioner gets the tangles right out; I am never left with tangles after washing my hair and applying the Pantene Smooth & Sleek conditioner. There's no greasy residue in my hair like some other conditioners leave. I highly recommend this conditioner. Effectiveness This keeps my hair from getting frizzy throughout the day. I have been complimented on several occasions for how smooth my hair looks. Scent The smell of this Pantene conditioner is amazing. I love that the scent lasts in my hair all day long. I get compliments on my hair smelling good all the time. This pantene leaves my hair feeling so soft and smelling great. It also leaves my hair feeling hydrated. Great to detangle the curls! I have naturally curly and long hair--I can't get by with ANY other conditioners but Pantene. This one seems to be the absolute best I have ever had at taking out tangles. Effectiveness It doesn't stop the frizzies for sure, that's another product. But detangling is what it does! I love Pantene Pro-V hair products. There is no exception for this Smooth & Sleek Conditioner. 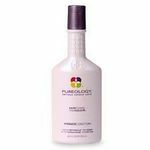 I have very long and straight hair and this hair conditioner works perfectly for me. Since my hair is so long, it tends to tangle easily and the Smooth & Sleek conditioner softens my hair so well the tangles brush right out. I love how smooth and soft my hair is after I use the conditioner along with the shampoo. I love that the conditioner leaves no greasy residue in my hair like some other conditioners do. Also, with some other brands my hair ends up being really frizzy and dry looking. Pantene's conditioner is the opposite. My hair is so pretty and moisturized. I would recommend this conditioner to anyone who has dry, damaged, frizzy hair because it really does moisturize and soften the hair really well. Effectiveness Pantene Pro-V Smooth & Sleek Conditioner works great. It leaves my dry, frizzy hair very smooth and silky. It also makes my hair look really shiny. It's great because it helps my dry hair as well as my dry scalp. Scent The smell of this Pantene conditioner is amazing. I love that the scent lasts in my hair all day long. I get compliments on my hair smelling good all the time. Pantene has so many verities to choose from these days and I really don't like all the choices. I am very disappointed if I can not find the smooth and sleek brand of conditioner. The smooth and sleek has a scent that I can live with, although I would like to have an unscented option available that would also be smooth and sleek. I have long hair and during the summer I swim daily therefore I wash my hair daily and I need to condition it daily as well. The smooth and sleek allows me to use less and still receive all the benefits of Pantene and the extra benefits of having smooth hair without the frizzy that sometimes comes with daily washing. My hair goes through a lot of abuse during the summer with clorine and sun exposure but my commitment to Pantene smooth and sleek conditioner keeps it all under control. 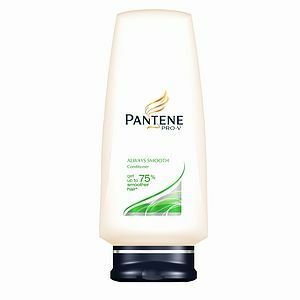 The only problem that I have is when I can not purchase this brand and usually if I settle for another brand of Pantene I am not very hapy with those other choices. Effectiveness The smooth and sleek is very effective Scent I do not like most of the scents in the different variety of Pantene Conditioners or Shampoo, however I tolerate the scent of the smooth and sleek and yet I would like to have an unscented choice. The Pantene Pro-V Smooth & Sleek Conditioner is one of the best conditioners for keeping my frizzy hair from becoming too unmanagebale. It is in the mid-price range, and I really like that you can buy it at any convenience store or larger supermarket. I have color-treated hair, and this does not make the color fade at all. I only have to use a small amount, which is really good because it makes the bottle last a long time! In addition to lasting a long time, this conditioner also keeps my hair really soft and shiny. 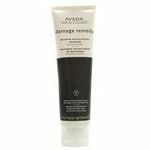 Typically, with other conditioners, I have to apply an anti-frizz product after I wash and condition my hair. With Pantene Smooth & Sleek, I can just blow dry my hair without adding any additiong products. Effectiveness This keeps my hair from getting frizzy throughout the day. Scent I really like the scent of all of the Pantene Pro-V products I have ever used, and this one smells exactly the same as the rest of their products. It keeps your hair smelling great all day long. I really enjoy using Pantene products. I especially liked using the smooth and sleek conditioner. I love that this product reminds me of a very high end salon brand but you can buy this product on a budget! I often times use coupons for this product which can be really helpful with saving money but not giving up the quality. This conditioner left my hair feeling extremely soft. I love that it didn't leave my hair oily and weighed down like some conditioners will do. I also really love that it left my hair so shiny and beautiful. 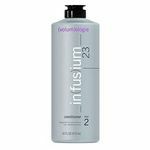 When you use this product your hair will be soft, smooth, and shiny! I also adore the way it made my hair smell. My hair smelled wonderful for hours! It also made my hair volume filled! My husband loves running his fingers through my hair after using this product! Effectiveness This is an extremely effective conditioner that will leave your hair soft and shiny!